The Drays believe that in the beginning the world consisted only of a single mysterious being known as the Gloom Mother, a slumberous spirit made up of a dark and formless mass of proto-matter in which time and space had no meaning. Time and substance only began when the Gloom Mother suddenly began to give birth to a huge variety of different beings. First to emerge from the Gloom Mother formless womb were the elemental spirits, who organised themselves into great hierarchies presided over by elemental lords. The elements were continually in battle against each other and in these days before the creation of Athas the world consisted of bizarre and ever-changing landscapes of elemental material which fused and altered as the elemental spirits engaged in their continual battles with each other. Eventually the entirety of the Gloom Mother's vast spirit-body consisted of this vast incomprehensible landscape. As result of the Gloom Mother's changed substance and the elemental battles that wracked it, she began to produce a whole new generation of beings. This second generation of offspring were an even more diverse collection, consisting of a countless number of mortal beasts as well as sentient mortals who enjoyed minds as adept as those of the elemental lords, such as humans and elves. The elementals found that the beasts relied on the elements themselves for sustenance and quickly made them their minions to fight their eternal wars. In those days all living creatures lived in these strange worlds and many species were extinguished as a result of the wars only to be replaced by another of the Gloom Mother's endless supply of new children. Eventually woken into an uncharacteristic state of awareness by the unending and pain that continually wracked her body, the Gloom Mother saw the futile and endless conflict that her creations now pursued. Lacking the capacity to take action herself, the Gloom Mother gave birth to fifteen great beings called dragons. Like the mortal beasts, the dragons consisted of a finite physical form and were not affiliated with any one single element. Unlike the mortals however, the fifteen dragons each possessed great powers similar in nature to the elemental powers and like them, were undying. The Gloom Mother hoped that these flawless creations would be able to achieve what she could not and impose order on her disordered world. The eldest and by far the most powerful of the dragons was Dregoth, who the Gloom Mother named Lord of the World and entrusted with leading the others. The Lord Dregoth, with the help of the lesser dragons, duly completed his task with masterful ease and banished each of the elemental powers and associated minions to their own plane from which they could not reach the other planes to do battle. Instead he gave each element a specific place in the void that was left. With earth he created a huge rock which he placed in the darkness and instructed never to move or change. He told air to sweep around the rock and breathe on its surface. He placed the sun and moons in the void just beyond the air and instructed them to circle around the earth-rock in his ordained pattern. With other elements he commanded that they may only appear in the world when certain rituals were completed. For example, fire was only allowed to appear when stone were rubbed together while water was only allowed to emerge from specific mouths in the rock or else at the whim of the cloud spirits who were charged with wandering around the rock with the winds in order to fertilise the earth. Finally, lest the elements ever forget their place and purpose, Dregoth placed in the darkness surrounding Athas the myriad star spirits and gave them the task of forever relaying his every instruction and purpose for all eternity. With the elemental spirits banished to their faraway planes, beyond the boundaries of space, and time, the new world teemed with mortal creatures who were now without lords or purpose. Turning his attention to these vast masses, Lord Dregoth assigned each of the fourteen lesser dragons, who he named the dragon princes, the task of ruling a portion of them while taking the best to be ruled by himself. Satisfied with his work he christened it Athas and named himself the Dread Lord of Athas so that all would know that his authority reigned supreme. However, despite all this work, Dregoth's new world was still incomplete. In this time there were no trees or plants and in order to survive the mortals had to each other or consume bits of the elements themselves. This was not the same as being given sustenance directly by the element's spirits and the mortals of this time were very weak. Seeing this, Dregoth went to the Gloom Mother who now resided somewhere in the darkness beyond Dregoth's rock, content with her greatest son's work. Dregoth informed her of the problems and instructed her on what he saw to be the answer. Hearing her son's wisdom, the Gloom Mother did as he instructed and fell from the void onto Athas, causing her spirit-body to fuse with the elemental structure of Athas. Having thus enveloped the world the Gloom Mother, only ever semi-conscious, fell into a deep sleep of eternal unconsciousness. As a result of this, her vast psychic mass began to break down into a vast number of spirits which inhabited the land itself. Earth spirits rose up and formed vast mountain ranges while elsewhere the gloom mother's unconscious psyche took the form of powerful water spirits which expanded and formed vast oceans. These new spirits were a kind of fusion of elemental substance and the spirit of the Gloom mother herself and as a result they contained the seed of spontaneous creation and mutation. This produced a new generation of creatures entirely different from the previous ones. The plants which began to sprout all across Athas' surface were made up of the very stuff of life but, unlike the beasts and the elementals, were utterly devoid of intelligence and thought. As Dregoth had foreseen, the other mortal life forms, the plants were able to draw sustenance directly from the elements without causing sickness and thus provided ample food for the mortals. The population of mortals proliferated as a result and Dregoth and his fourteen dragon princes were able to forge vast domains over the surface of Athas, ruling with an iron fist and preventing the emergence of elemental worshippers that might once again bring about the endless conflicts of the elemental lords into the physical realm. For thousands of years the life of Athas slowly grew and prospered under the wise governance of the fifteen dragons. The sentient beings of Athas became far more than the slaves they had been under the elemental lords and filled their bountiful empires with great wonders. Dregoth himself built the sacred city of Giustenal by a beautiful sea where he gathered the best of the world's mortals and erected a magnificent palace which he used to peer into the void and harness the secret powers of the universe. But as the centuries wore on, Dregoth saw that amidst what should have been a world of order and harmony a terrible corruption was emerging. There were many imperfections amongst the mortal creatures that were becoming increasingly evident. They had become full of pride and conceit and many had made covenants with the elements and were working to reawaken the battles of the past in pursuit of their own power. The physical harmony of the land was beginning to deteriorate and rebellions against the dragons became more frequent. Athas' destiny had begun to shift from Dregoth's pre-ordained path set out in the sky. 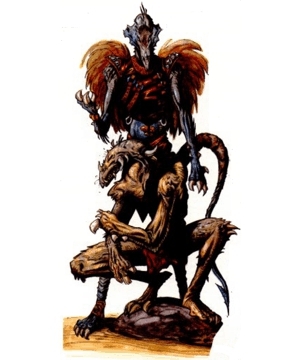 At first Dregoth had believed these problems would gradually disappear as order became more firmly established over time, but instead the sentient beings of Athas seemed to grow more corrupt as their power grew and by the middle of the 9th millennium since the world's creation (a time period which seemed far shorter to Dregoth's immortal eye then it appeared to the uncountable generations of mortals that lived and died in that time) he had discovered the problem and formulated a solution to resolve it. When the Gloom Mother had fallen upon Athas her spirit had entered not only the land but the souls of all her beasts. This did not matter to the dumb beasts who were driven by instinct and not thought or imagination but the many sentient races that now sprawled across Athas were fatally infected them with the very stuff of spontaneous creation and chaos and it was this that moved them to go against Dregoth's ordained order. He saw how over time the original forms of the mortals had become distorted and changed as the powers of mutation had slowly worked on them over the centuries. Some had even spawned entirely new races that bore little resemblance to their parents. Of the sentient races only the humans and their childlike cousins the halflings had retained their original form. The halflings because their childish innocence made them immune to the corrupting effects of the Gloom Mother's substance and the humans because of their hardy and exalted nature gave them the ability to resist the impulse of change. The other races however, were no longer what they had been born as. They were inherently impure and as they gained more and more power in their powerful empires, only became increasingly inclined to follow the corrupt dreams that their diseased souls implanted into them. Dregoth, looking into to the future, saw that unless something was done they would eventually tear apart and destroy the world he had created and return it to the eternal chaos that existed before it. This evil intent remained hidden while the empires of the demi humans relatively weak and in many it was even unconscious, but all contained this seed of destruction and all would eventually fall to it in time, killing their human brothers, making the weak halflings their slaves and overthrowing the dragons to return the world to an eternity of struggle and chaos. 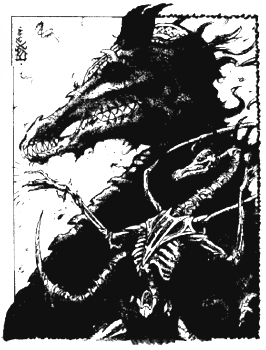 Thus the Dread Lord ordered the dragons to end the multiracial unity of the empires and separate humanity in preparation for a righteous war of annihilation against the impure demihuman races. Dregoth told them how they would have to destroy the world they had created in order to create a new one free of the dark destiny to which the demihumans would inevitably lead it should they survive. The fourteen were initially reluctant to abandon the great empires they had created but eventually duly set about fulfilling Dregoth's orders and preparing for the crusade which he had ordered. Unfortunately for the dragons, their previous tolerance had meant the demihumans had grown very powerful and had already found ways to return to the elemental spirits something of their ancient powers, so that they might aid them in their quest for power. This and the fact that the impure races vastly outnumbered the forces of humanity meant that the Cleansing Wars, as they became known, were to last far longer than expected as the elemental lords desperately fought against their rightful masters and the demihumans swamped the cities of humanity. At one point Giustenal itself was temporarily taken by an evil lion-headed giant. However these evil forces were still too weak to be able to stop the defeat and slowly and inevitably they saw their insurrectionary empires fall to the combined might of the fifteen dragons. Victory and purification were not to be achieved in the end however. Not as a result of demihumans themselves, but as a result of treachery in the highest ranks of Dregoth's army. Jealous of Dregoth's power the fourteen dragon princes foolishly believed that with the wars nearly over they could overthrow the Lord and divide the world amongst themselves. Thus after at the end of the 12th millennia, when all but six of the original fifteen impure races had been eradicated and those that remained were scattered - holding out only by continually fleeing - the fourteen turned their attentions away from their campaigns and gathered their armies to march upon the holy city of Giustenal. The valiant folk of Giustenal fought with great nobility and vigor against the combined armies of the dragon-princes and aided Dregoth in slaying two of the treacherous beasts. But the princes had cowardly appeared at Giustenal by magical stealth, emerging from the dark sky above the city, so that the city was not prepared for battle. After fourteen days of heroic defenses, the princes succeeded in their terrible aim and reduced the great city to a devastated wasteland, leaving its ancient king dead amidst the ruins. Only a fraction of the city's vast populace survived the princes' cruel onslaught and these few gathered in the woods outside Giustenal where they were told by High Templar Mon Adderath to await the return from the dead of their god. The few waited for many months in terrible conditions for their king to return to them and many disbelieved Mon Adderath's words, leaving the woods in search of more hospitable conditions, only to be captured by the princes' armies and forced into brutal slavery. But the majority had faith in Dregoth and after eleven months were rewarded for their righteous actions when the Dread Lord appeared to them bathed in a magical light and called for them to follow him far down into the bowels of the earth where the perpetual darkness would hide them from the prying eyes of his sinning lieutenant-kings. Once they had arrived, down the enchanted passages to the caverns at the bottom of the earth, Dregoth told them of how his treacherous princes' had entered into a diabolical pact with the elemental lords to steal his godly prerogatives and overthrow his ordained order, returning the world to elementals and thus subhuman demon races. Although he had defied their assassination and returned from death, he was unable to defeat the combined force of all surviving twelve. Only here at the centre of Athas had he found secret places from which to again gather the forces of the righteous and avenge the destruction of Giustenal to complete the divine task entrusted in him so long ago by the mother of all life. The survivors followed Dregoth into a vast cavern in which the Dread Lord told his loyal followers they would make their new home and where they would await the time when they would return to the surface to avenge him. Dregoth thus oversaw the slow creation of a New Giustenal far below the Tablelands, transformed from a huddled mass of barely a hundred wretched survivors to an ordered and majestic city enjoying living standards that exceeded those of the average inhabitant of the crowded cities above. From his newly-created palace in New Giustenal Dregoth was once again able to resume the arcane studies which would enable him to fulfill his divine task. As a result of his studies, he created many wondrous devices, the greatest of which was a mirror which allowed the user to enter the world of dreams in which physical form was brought to the creatures of the imagination. Most importantly however, the Dread Lord learnt more of the nature of creation and came upon the divine revelation that since all the Gloom Mother's mortal children and all her elemental offspring were the results of spontaneous, random creation they were inherently imperfect beings, including the two loyal sentient races, the humans and the halflings. He saw how the fifteen beings were unique among the Gloom Mother's children in that they were creatures of conscious design and purpose, and it was thus this that gave them their inherent physical perfection and a spiritual state of grace from which they could only fall by deliberate intent, as the fourteen princes had done. Dregoth decided that if he were to successfully complete his task of creating a world that remained true to his divinely ordained order, he would have to populate it with sentient beings worthy of participating in his kingdom. To this end he developed a process by which he could transfer something of his own divine being onto that of his worshippers. The first on whom he imparted the gift of this draconic form failed him however, by corrupting physically and becoming rude disfigurements of his intended form. These impure beings were thus cast away to the firey caverns of Kragmorta where their descendants reside today. The second subjects of transformation lived up to Dregoth's expectations and Dregoth named his beloved creations the Dray, the children of Dregoth. They were to be Dregoth's chosen beings, the intended rulers of the future world, blessed with the state of grace that was the draconic form and made spiritually and physically superior to all other forms of creation bar the dragons themselves. Of the future, Dregoth reassured his people that though the princes had slain him and now held sway over the surface world, they would not be able to prevent him resuming his rightful place as lord of Athas when the time was right. The princes had foolishly thought that they could rule just as well as the rightful ruler of the world, and that they could control the elemental lords with whom they had made an alliance. Instead, lacking Dregoth's divine wisdom, they had been unable to protect Athas from a dramatic deterioration. Without Dregoth's leadership, the dragons had been unable to complete the Wars against the unclean demihumans and chose instead to shamefully disguise their draconic forms so their true nature would not be recognised by their former enemies. The dragons hoped that in their new guises they would be able to maintain order if they kept a strong enough grip on their people but because they had broken the divine order and tolerated elemental worship as part of their deal with the elemental lords, the battle between the elements reasserted itself and Athas has long since fallen into terrible disharmony. The forests have been replaced by a searing waste and the sea turned to an ocean of dust as fire and earth triumph over the element of water. The dragons were not even able to sustain their unity without Dregoth's leadership and over the centuries a further two of the great beasts has been killed in the petty squabbles in which they indulged themselves, reducing their number to ten. Likewise, the dragons have proved unable to maintain their vast empires, seeing them reduced to one-city outposts amidst the warped wasteland that their rebellion has created. For 2,000 years Dregoth has told his children that they are destined to return to the world which is their birthright. He has told them of plans which will one day cleanse the world of the traitors and their minions and restore Dregoth to the throne of the universe, so that he might set about the completion of his divine task and create a new world free of imperfection and corrupting disorder. These plans will commence on the Coruscation, the Day of Light, when the dray will emerge from their hidden city to begin an epic battle against the unclean denizens that swarm across the surface world. Their mission will be to complete the annihilation of the unclean races and to execute the remaining dragon-princes. Only the humans who rightfully see the light and join the true cause will be granted the salvation of the dray transformation, to join Dregoth's chosen children in populating a changed world. For from the ruins of the old the Dread Lord of Athas will create the purified light of a new world in which the original dray of New Giustenal would all be kings, the implementers of Dregoth's divine dreams. The prolonged funerals of the dray always cumulate along the banks of the Blackjaw River where the mourners sing songs of calling to the mysterious undead Keeper of the Graves. Eventually he will emerge in his barge from the gloom where the river enters the rock and silently accept the deceased dray being placed on the boat. The body will then be ferried down the river to the fabled Cavern of the Ancestors, a city of grave stones and tombs located on the far side of the serene underground bay where the Blackjaw terminates. It is here that all the loyal second generation dray have been buried since the Transformation and where they now faithfully await the day when their Lord will be restored to his rightful place. When he does ascend, it is said that the Lord shall cause them to rise again in order to serve the Great Dragon for eternity. This sacred place is forbidden to all living drays except for those bereaved who may choose to accompany the deceased to the Cavern to tend his grave, in which case they may never return to the city of the living. A somewhat different fate awaits non-drays who die at the hands of the dray and those drays who have committed grave sins against their kin. Like the loyal dray they are transported by barge down the Blackjaw River but instead of proceeding to the river's final termination the barge takes a turning down a side-tunnel to the Cavern of Redemption. The redemption in question consists of the deceased's soul having its free will removed so that the will of Dregoth and his templars may be enforced upon to serve him in undeath. The fate of those non-drays who die beyond the Dregoth's dominion is thought to depend upon the will of the soul. Initially the disembodied spirit will stay attached to his body and refuse to leave the environs of his grave. But after the physical body wastes away the soul may turn to wandering Athas where he may find a pregnant female whose growing fetus he will possess or else rejoin the Cloud of Souls, a mysterious collection of millions of souls lost amongst each other. Souls may also emerge from the Cloud, sensing a new body to inhabit. For the dray however, the spirit of a newly born dray is thought to come from the divine essence of Dregoth himself. If a female dray has a stillborn she or her family are considered to have done some deed that has angered the Dread Lord and will have to appease him with offerings to him and the Priestess of the Brood. If there are continual problems of any sort with the child it is often thought to have the soul of a non-dray from the Cloud of Souls and will have to undergo the Ritual of Transcendence (to which newly-transformed dray are also subjected) so that its soul might rise to the state of grace necessary to become worthy of occupying the blessed draconic form. Elemental worship is forbidden in New Giustenal since elementalists are thought to be in league with the elemental lords' continual strivings to destroy Dregoth's order and return the world to the fruitless struggle of its infancy. Likewise druidry is thought to necessitate manipulating the spirits of the land against their rightful place in Dregoth's order and so is also forbidden. Defilers, known as blood-letters to the dray, are believed to take their power for their spells from the substance of the Gloom Mother as manifested in the vegetation. The process is thought of as a kind of sacrificial rite (hence the term blood-letter) done in the name of furthering Dregoth's aims. The blood-letters are held in considerable awe and fear by the general populace of New Giustenal. Unlicensed defiling is strictly forbidden since only Dregoth has the right to allow the sacrificing of a part of the Gloom Mother's body. There are no preservers in New Giustenal and the dray are not aware of any other form of wizardry. For the dray, the disparity between body and soul and the distinction between the material world and the ethereal world is only true from the perspective of mortals. In divine beings and elemental spirits the two are united. All dray have an instinctive understanding of this concept and so it is thought only natural that especially gifted drays can unite body, mind and soul to gain the powers of the psionicist. The dragons, the divine beings, are thought of as creatures of exceptional spiritual grace and power (with Dregoth being by far the most powerful of course). The exact nature and limitations of Dregoth and the other dragons' powers is something not to be comprehended by mere mortals, just as the precise functioning of the world is not to be understood by them either. Hence, it is simply taken for granted that Dregoth has the power to grant spells to his templars. Since the death of Abalach-Re, the dray have begun entering the later queen's anarchy-stricken city to make converts amongst the populace. The dray chosen for this task disguise themselves in heavy robes and impenetrable veils to preach the doctrine of the "Unamed One". They make use of the dramatic events of recent history (such as the death of four monarchs and the great earthquake) to claim that Athas is entering its apocalypse. They predict that on the day of the Coruscation, His name will be proclaimed and the true sovereign of the universe will re-emerge from the darkness to destroy the present world and remake it in his rightful path. Those who oppose him with meet with eternal damnation beneath the earth while those who obey him will live forever in his blessed religion. In New Giustenal itself, the religion of Dregoth forms the basis of dray society. All the dray have complete faith in its truth and regularly attend services in one of the three temples of the dragon where the learn the legends of the path and have the wisdom of Dregoth illustrated to them. The most important events of dray society are all involved in pleasing Dregoth in some way and sacrifices to him and his priests are made at every occasion. A proportion of whatever an individual dray earns or produces must always be put aside in offering to the Dread Lord making his presence and power a constant force in the lives of every inhabitant of the city.